The first night of their tour, Thursday, March 9th was a "secret" show at Bush Hall in London with a capacity of 350. The band first announced the show and ticket link as a headline show for "The Young Renegades" on their hustler fan club site to poke fun with fans as their new record, Last Young Renegade comes out this June. However many fans did not really get the joke and they ended up having to tweet about the show to sell it out. It was a very intimate show, definitely the smallest ATL show I've ever been to and was complete with their normal antics and banter along with a few extra songs (This Girl's a Straight-Up Hustler, Let It Roll, Stay Awake, and a bit of The Beach). It was a super fun show and since it was so small, they were able to connect and talk to the audience even more than their other shows. 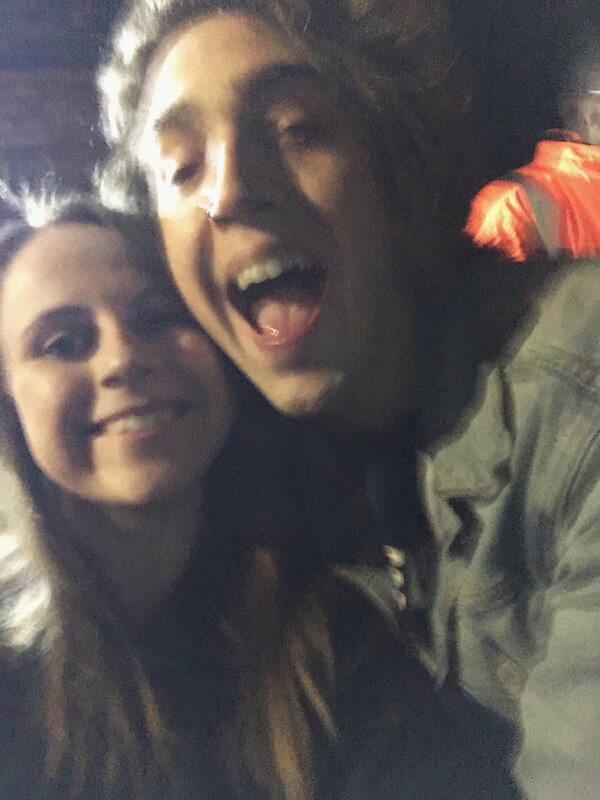 Alex even commented on my phone's background (a picture of him and I from about a month before) when I had my phone in the air at one point and yelled "OMG IS THAT US?!" It was definitely a special night for the small group that were able to attend the show. They also made three live debuts, Canals, a fan favorite off their re-release of their fifth studio album, Don't Panic, as well as Take Cover, a song released this past summer on Straight to DVD II: Past, Present, and Future Hearts, and their newest single Dirty Laundry. Friday, March 10 was the start of the real UK Tour and was at the Hammersmith Apollo in London. With a capacity of about 5,000, I decided to buy their signing package, which included a pre-show signing with the boys, early entrance to the venue, and a copy of their new album when it is released this summer. I got to the venue a little before noon and was lucky to find only about 30 people in front of me for the signing. We were told in an email that people who had the signing package needed to be at the venue before 2pm, so I decided to come a little earlier to make sure I would be towards the front. The normal general admission had well over a hundred people lined up and some had even camped out overnight. Although I was only about 30th in line, I knew there was also a meet and greet of about 30 people that would be let in before us, so that made me around #60, which is pretty good for a general admission show. After checking all of our names for the signing, we finally went in around 3:30. The signing was quick, as apparently 350 tickets for the signing had been sold on that date. We all received a signed poster by the boys and about a minute to say a few words to each. After that, we were lead back outside to line up again in our spots. The meet and greet line went in a little after 6pm and then we were let inside around 6:50, with the doors to the general public opening at 7pm. They had scanned our tickets and checked our bags outside while we were in line, so when we were finally let in, it was a stampede of people sprinting to try and get to the second and third rows. We managed to secure a spot in the second row. After Waterparks, the band SWMRS was on. I knew SWMRS solely because the drummer is the son of Green Day frontman, Billie Joe Armstrong. I have listened to their songs on a couple occasions but never really got into their music so I didn't have any expectations for their set. Pretty much as soon as they came on stage the lead singer, Cole, looked out at the crowd, smirked, and twirled his fingers, motioning for the crowd to start a circle pit. From that moment until they walked off stage, the crowd was very pushy, sweaty, and had at least two or three mosh pits. Let's just say I was happy when their set finally ended. Finally All Time Low came on with extremely high energy to their song Kicking and Screaming. They went through almost the exact same setlist as the night before, but the crowd was very very rough and it was hard to enjoy the night. All Time Low put on a great show and I managed to stay in a pretty good spot for most of their show. However about halfway through their set, I had three full cups of water spilled on me and was already covered in my own sweat, along with sweat from many other people around me. The boys were chatty as always with numerous inappropriate jokes including how they would only swear 15 times since Jack's parents were in attendance. Jack also called someone out who was dabbing and yelled "there's no dabbing in the pit!" After they played their latest single, Dirty Laundry, Alex commented that it might be his favorite song he's ever written and that he is very excited about their new album coming out. Although fans were a little torn at first at the new direction they seem to be taking for this album, it seemed as though they had come around. It was one of the loudest sing-alongs at the show and at times the crowd was louder than Alex singing. Although I was more than happy to go home and take a shower, I was very excited to see them again on Tuesday where I also had a meet and greet with the boys! On Tuesday, the show was at the Cambridge Corn Exchange in Cambridge, England, about a 45 minute train journey from London. I took the train shortly after I finished class and headed straight to the venue. Because I had meet and greet, I didn't get end up getting to the venue until around 4:45pm. Not too long after I got there I actually saw the lead singer of SWMRS, Cole Becker, walk out and start walking down the street, no one seemed to notice but he turned around and saw me just staring at him, I think we were both expecting there to be some sort of commotion or even just a few people point and say something to him but no one did. Instead he waved and I waved back and he kept on walking. I love seeing little moments such as that when there are hundreds of people waiting outside and someone like Cole just casually walks by to go explore the area (or whatever he may have been doing) and no one really noticed. We waited until about 6 when they finally called up the people who had meet and greets and let us in one by one after checking our IDs to ensure we were on the list. Once we were inside, a guy from the ATL crew brought us into the stalls, told us the rules and how it would work and let us put our coats/bags down. About a minute of two later the guys came down and we started to get into lines to talk to/get pictures with each of the members. Naturally I went over to Alex first and was the third person to talk to him. I was super nervous as I had only briefly talked to him once before and I was with a group of people last time. I gave him a hug and he told me he liked my shirt. I thanked him and said that I had bought it at the London show and then had him sign my ticket, and took a quick picture. My hand was shaking so much when I went to take the picture, he just laughed and said, "It's okay, I'll take it!" He took a couple pictures and we hugged again, I said thank you and that was about it. After that, I went over to Jack, then Zack, and Rian. I had a little bit of conversation with each of them but don't honestly really remember exactly what we said after talking with Alex. When I walked up to Rian he looked at me kind of weird and took my ticket to sign and then said "Oh my gosh, your doppelgänger is here." I was not really expecting that so I just said "What?" and he said something like, I thought you had already come over to me but then I realized there's someone else that looks just like you! But she was wearing a different shirt! I don't really remember what I said, I think I just nervously laughed and said, oh wow really? And he said, "yeah, go find your twin!" Sadly my pictures came out TERRIBLE that night and the lighting didn't help at all. After about a half an hour, the boys had to leave so we got to go to our spots to get ready for the show. Luckily I managed an amazing spot right in the center of the barricade. Waterparks went on first and luckily the boys were feeling a lot better than they were in London. They put on an amazing show and I think I had the best spot in the whole venue being right in front of Awsten. They seemed to enjoy themselves a lot more and Awsten was definitely able to sing a whole lot better than he was a few days before in London. Their personalties were able to shine through, unlike the London show where they barely talked in between the songs. The crowd was definitely into their performance and it seemed like a lot more people knew them or just enjoyed their set a lot, which in turn made for a better time for everyone. They even tweeted after that it was their favorite stop on the tour thus far! SWMRS came on shortly after Waterparks and I enjoyed their set 1000x better than I did on Friday. They still told the crowd to do a circle pit and tried to do a wall of death, but either the crowd, the band, or a combination of the two were not nearly as rough as they were on Friday and for that I was very pleased. Not only was their set easier to handle, but I really enjoyed their songs and performance. You can tell each of the guys have their own personality and style that although so different from the others, are able to come together and create this cohesive unit that I've never seen before. They played a great set and I really enjoyed every minute they were on stage. All Time Low were next to perform and came on shortly after 9:30. This was the first time I was able to enjoy an entire All Time Low show (that they were headlining) from the barricade and it was nothing short of amazing. About midway through Alex performed Therapy solo and there seemed to not be a dry eye in the house. Directly after, Alex grabbed an acoustic guitar and made a heartfelt speech and offered his heart to anyone struggling with addiction or knows anyone that is. He told the crowd that it can be tough, but you can get through it and the next song, Missing You, went out to them. They ended with Take Cover and came back out a couple minutes later for a high energy encore of Lost in Stereo and of course, Dear Maria, Count Me In, where Alex and Jack always jump in the crowd for the end, complete with confetti canons. The next date I went to see them was on Thursday, March 16 at the O2 Academy Birmingham. I also had a meet and greet for this show so I didn't get to the venue super early. Birmingham is around a 1.5 - 2 hour train ride so I ended up getting to the venue just before 4pm. I actually meant to get there around 3:30, but missed my first train! Outside there were several different lines so it took me a while to figure out where to go as this particular venue had another show going on in the same building that night as well. We waited about 2 hours and they started checking our names just after 6pm. We were let inside around 6:20 and went through the same motions as Tuesday. Soon after we were able to put our things down, the boys came out. Everyone was a little quiet as the guys started walking over to different parts of the room so I took it upon myself to just run right up to Alex first and give him a big hug. He had a big smile, laughed and said "Hi love!" We talked for a little bit, he signed my album, and we took a picture. As I said goodbye and started to walk over towards Zack, I realized my pictures came out really bad and were super blurry. I was wicked upset because I think I was so nervous I took them so fast and didn't realize they were so awful. 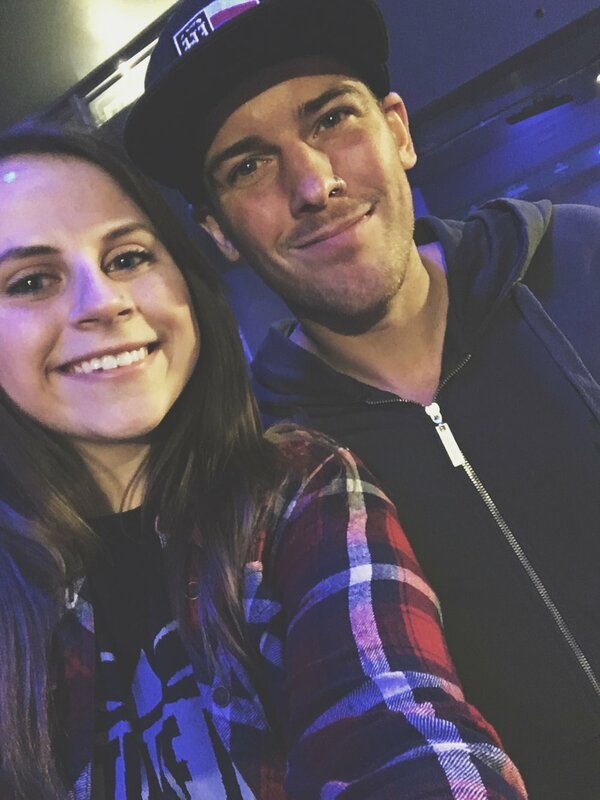 Once I got to Zack, I couldn't tell if he was reaching out to hug me or reaching out to grab my album so I kinda tried to hand him my album while going to hug him but it didn't really worked so he laughed and said "okay wait give me a hug" and I laughed gave him a hug, and then he said "alright do you want me to sign this?" while he was still laughing a bit. It was super cute and afterwards we took a cute picture! After that I went over to Jack and he had a really big line because two girls were talking to him for a long time. 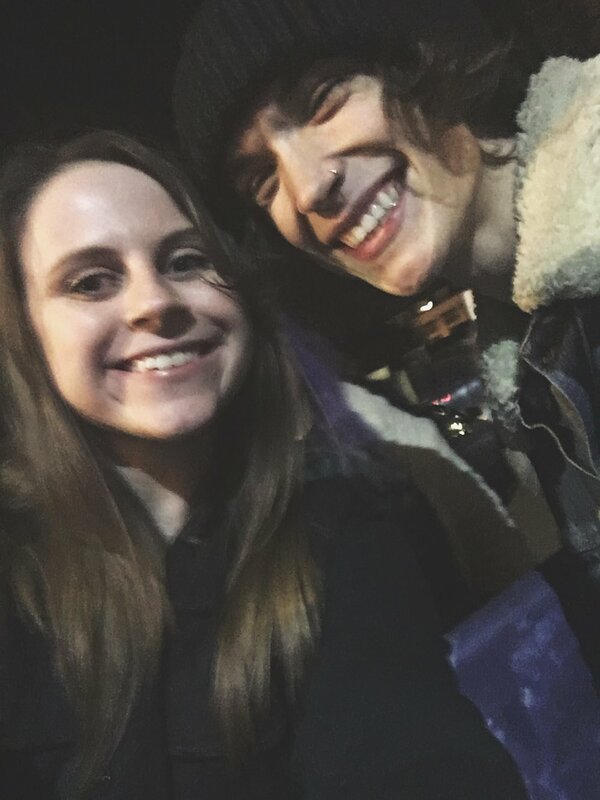 I didn't talk much to Jack this time, but I hugged him when I said hi and bye, but I pretty much just said hey how's it going and he said that he was good and he was happy there was really good lighting in the venue. 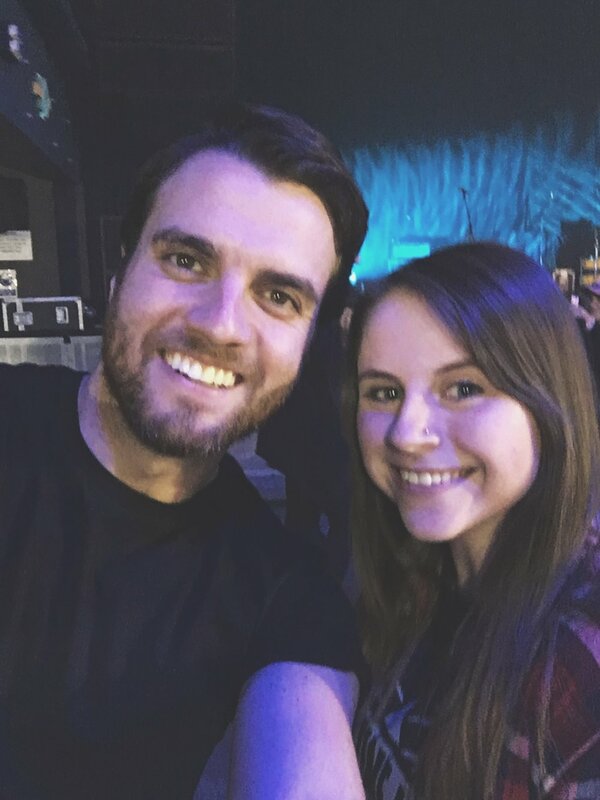 When I got to Rian, he gave me a super big hug and then took my phone and took a picture of one of the crew members and thought it was really funny. I didn't really know what to do or say afterwards and then he took a picture of us super fast and I wasn't really ready for it. After Rian, I realized they haven't given a 5 minute warning and there was still big lines for all of the guys so I decided to go back to Alex and try to get a better picture. I usually would never go up again to them cause that's super uncomfortable and we were told not to go up again until everyone had their chance and only if there was extra time. But because my pictures from Tuesday came out wicked bad and then the one I just took with Alex came out even worse, I decided to try it. When I got up to him he had a big smile and said "HEY! YOU'RE BACK!" with his arms wide open to give me a hug, I think I nervously laughed (like I always do) and gave him a big hug, like one of those hugs you give someone you haven't seen in forever and you almost start swaying or walking. After I told him my pictures came out super bad last time and he said "Oh no! Thats okay you can try again!" And then we took another picture that came out so much better and I thanked him again and then he gave me a hug again. Right then they gave the five minute warning so I went back to my stuff and got ready for the show. Unfortunately for some people and lucky for me, the stage for Waterparks was set up a bit different than before. The middle microphone stand was set off to the right hand side and the drum kit was centered. 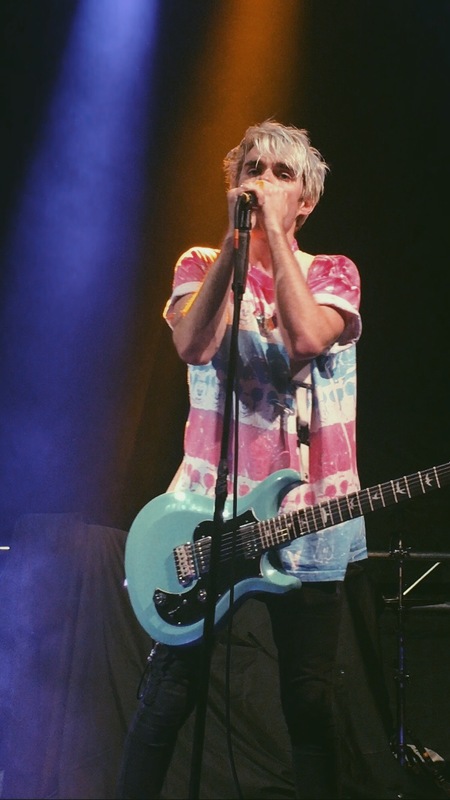 This caused many people to perceive Awsten's microphone stand as the center of the stage and decided to go towards the right hand side. I actually wanted to be in the middle to the left a little (to be in the middle of Jack and Alex) but ended up being straight in the middle, which I could never complain about. Waterparks came on right at 7:45 and were definitely back to their normal selves. Even if they still weren't feeling 100%, you definitely couldn't tell. The only thing that sucked about it was there was at least ten photographers just walking around in front of the barricade. The band was super interactive with the crowd and they seemed very happy and excited to be playing. In the video below, you can hear Awsten say "What does that mean?" in the middle of the playing Hawaii (Stay Awake). The girl next to me had her phone up and wrote "Come snogs?" on the screen. For anyone not from the UK, snog basically means makeout. He actually asked about it again a couple songs later again but before she answered, he quickly retracted and said "nevermind, that sounds dirty" and then commented on someone's poster. He seemed more himself this show than he had the other two and said he was bummed to leave when it was their last song because he was having so much fun. SWMRS were great again in Birmingham and I really enjoyed their set. They didn't try to start a circle it or anything but the crowd was very lively without it. They put on a great 8 song set and Jack seemed like it too. He was hidden off to the side of the stage and watched almost the entire set. I really enjoyed their entire stage presence. I know a lot of people are able to take on a different persona when their playing on stage and SWMRS definitely have this electrifying persona but its almost hidden from their grunge and quirkiness. I've never seen someone perform quite like them and its so intriguing to me, I just want to watch them perform all day. I also appreciated Cole's messages telling the crowd to make sure they always think for themselves and to not give into all the messed up evil in the world. Even with their fun performance, they seem extremely down to earth and genuine people and I hope to meet them and talk to them at another show in the future. All Time Low came on after at around 9:30pm. They have been on time every night which is greatly appreciated as I had a train to catch back to London leaving at 11:10pm and the next one wasn't until 6am. They always have fun and interact with the audience, but it was definitely profound in Birmingham. There were several things thrown on stage and Alex put on a pair of guitar sunglasses, a tiara, and a "birthday girl" pin while playing. They were their normal funny and inappropriate selves and played with such joy and high energy from start to finish. 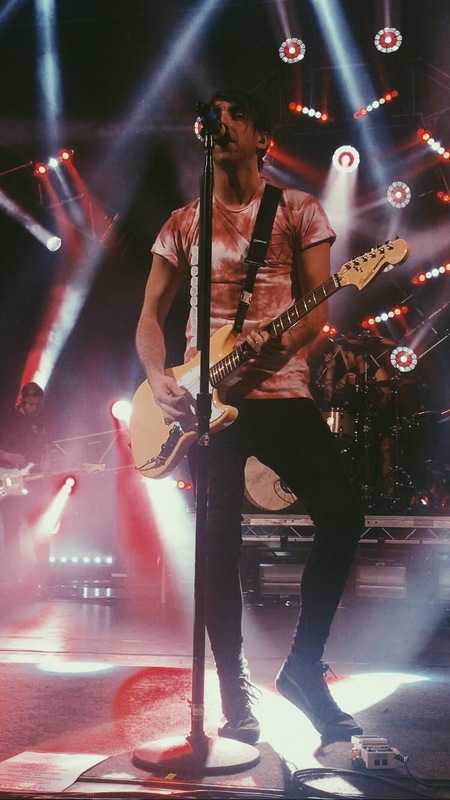 About two weeks after the Birmingham date, I got to see All Time Low again at their last date of the UK tour at the O2 Academy Brixton in London. I didn't manage to get meet and greets for either London show but luckily I bought the album signing package that granted me early entry. I did about the same thing as I did for the show at the Hammersmith Apollo and got to the venue just before noon. We didn't get let into the signing until after 4:30 but there was less people in the signing than the other London show so they got through the line pretty fast. They let us inside for the show around 6:30, even though doors didn't open until 7. Waterparks came on first and it was probably the best I've seen them play the whole tour. They all seemed so excited and happy to be playing. Awsten even mentioned that it was the biggest venue they've ever played to. He was very talkative throughout the set, which I love because I think he's hilarious and it makes the show that much better. He joked around, wore a flower crown, and even opened with "Hi, we're Waterparks and you're watching Disney Channel." SWMRS came on at 8:30 and I was excited to see them again. I took it upon myself to listen to a lot of their music in the two weeks I hadn't seen them and was happy I got to experience their set knowing the songs a bit better than the other times. They put on a high energy show filled with lots of fan interaction and definitely got the crowd ready for All Time Low. Cole did his usual spiel making sure the audience knew that even though there's a lot of messed up evil in the world right now to not give in and to always make sure you think for yourself and added "Rock n Roll won't solve your problems, but it will help you figure them out!" All Time Low came out at 9:30 and started the show off like the others with Kicking and Screaming, Weightless, and Somewhere in Neverland. However instead of going to Six Feet Under the Stars like the other shows, they had a few extra surprises for the last night of the tour. Only a week before this show, All Time Low released their second song off their upcoming album, Last Young Renegade. Although it was released, they hadn't played the song at any of the other tour dates because they wanted to debut it live in London like they had done the other song, Dirty Laundry. The crowd loved it and Alex commented on how thankful he was so many people were singing along when they had just released the song only a week before. Towards the end of the show Alex called out each section of the crowd to cheer, the left side, right side, balcony, and then Geoff (from Waterparks). Geoff is a big fan of All Time Low and even mentioned how excited he was to watch them play after pointing out that he was wearing ATL merch on stage. On Thursday, the day before the show, All Time Low was featured on a segment called "Live Lounge" on a popular radio station, BBC Radio 1. As part of the Live Lounge, a band/artist plays one of their own songs and then a cover. All Time Low decided to cover Lorde's new single Green Light. They decided they liked playing it so much that they were going to play it again at the Brixton show. This was a real treat because they will probably never perform that cover ever again and they did a phenomenal job making the songs sound like it was their own. They then went on to play A Love Like War, which Alex started off by saying "Here's a song Jack can't play very well!" That followed by Take Cover which Alex jumped in the crowd for, and hasn't since they first debuted it live at the Young Renegades show earlier that month. After coming back out for the encore and playing Lost In Stereo, Alex pointed out how at every show people tell him to play Jasey Rae so he decided he finally would. It was for sure a crowd favorite and is always awesome to have an extra song added to the setlist. The show of course ended with Dear Maria, Count Me In where Alex and Jack both normally come down to the crowd for the last bit, but Jack was the only one that came down and Alex finished the set on stage with confetti flying everywhere. They thanked the crowd and threw out the rest of the guitar picks, drum sticks, and setlists to fans in the front few rows and then ran off stage. After the show, I knew there was a pretty good chance I would be able to meet Waterparks and/or SWMRS. SWMRS had said they would by the merch table, but I knew I would rather meet Waterparks if I was only able to meet one of them. Since Waterparks hadn't been going to the merch table during this tour, I figured it was best if I waited outside instead. I tried to figure out what everyone was doing if there was any spots people were particularly hanging around. I ended up picking an area to the left of the venue and ran into some friends I had met at another ATL concert and talked to them for a while. I then went over to check out the other side of the venue again and I almost turned back around when I realized Geoff, from Waterparks, was standing over to the side talking to 5-6 people. By the time I went over to him, he was only able to talk to and take pictures with two people before his tour manager said he had to leave. As he started walking away a girl and her mother ran up and started taking a bunch of pictures with him. He was way too nice to say no so he just let them take pictures and even signed a few things. I decided to take a chance and I went over and once he finished with them I gave him a hug and took a picture really fast and then he had to leave. I hung around that area for a while and then I saw a few girls I knew and they were trying to find Waterparks as well. 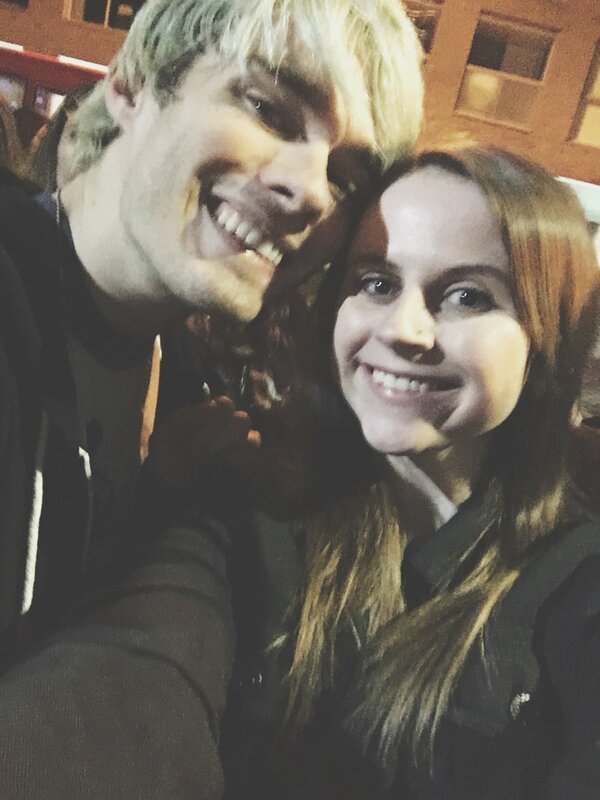 I really wanted to meet Awsten and since I was in just in London I didn't mind waiting around a while. After waiting for a while and security making us move a couple times, Awsten walked by us to go to his tour bus. He said hey and after he dropped off his stuff, he came back to talk to all of us. Although I had met Awsten before, it was super brief and we didn't get a chance to take a picture so I wanted to make sure I got one this time. We had a really nice conversation and he literally hugged me three times. He's one of the most genuine people I've ever talked to and I'm already looking forward to seeing him again soon. I also got a quick picture with Otto before he had to leave and was lucky to leave with pictures with all three of them. Overall I had a very successful time at All Time Low's UK tour. Each night was special in its own way and I definitely recommend seeing all of these bands. Although the UK tour is over, they are doing a US leg this summer and I will definitely be at the Boston date and excited to see all three bands another time. (And hopefully finally meet SWMRS!) Check out their tour poster below for all the places their hitting this summer and grab your tickets before more dates sell out!